Danell Leyva Photos, News, and Videos | Just Jared Jr.
Zac Efron flashes a peace sign while making an appearance on the Today show on Wednesday (August 17) in Rio de Janeiro, Brazil. The 28-year-old actor was stopping by the show to talk about meeting Simone Biles and the rest of the women’s gymnastics team but also ended up meeting male gymnast Danell Leyva, who won silver on both parallel and horizontal bars. After surprising the Final Five the day before, Zac and the team decided that they were going to grab pizza while he was in Rio. 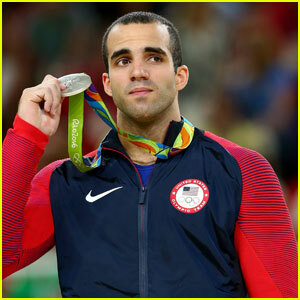 Danell Leyva Wins Silver in Horizontal Bar at Rio Olympics 2016! Danell Leyva holds up his silver medal after competing in the Horizontal Bar Finals during the 2016 Rio Summer Olympics at the Rio Olympic Arena on Tuesday (August 16) in Rio de Janeiro, Brazil. The 24-year-old gymnast came in second place, pushing his Team U.S.A. teammate Samuel Mikulak to fourth place, just missing out on the bronze medal. Danell got a score of 15.500 while Samuel scored 15.400. “When the going gets tough, the tough get going. Motivated for high bar finals. So proud of @Alex_Naddour for his bronze on Horse!! !” Samuel tweeted the day before. 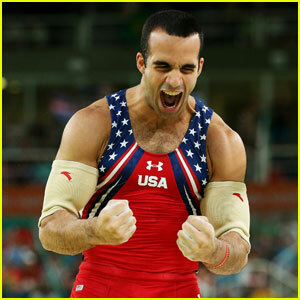 Danell Leyva celebrates after competing in the men’s team gymnastics final of the 2016 Rio Olympic Games at the Rio Olympic Arena on Monday (August 8) in Rio de Janeiro, Brazil. The 24-year-old gymnast and his teammates – Sam Mikulak, Chris Brooks, Alex Naddour, and Jake Dalton – placed fifth behind Japan, Russia, China, and the U.K. The team also placed fifth back during the 2012 London Games. They haven’t won gold as a team since the 1984 Olympics in Los Angeles. 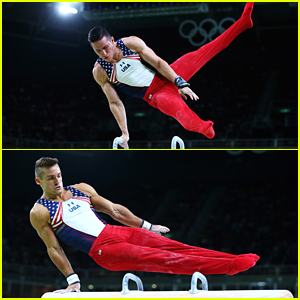 Sam Mikulak and Alex Naddour show off their pommel horse skills in these shots from the Artistic Gymnastics Men’s Team Qualification during the 2016 Rio Summer Olympics on Saturday (August 6) in Rio de Janeiro, Brazil. Along with teammates Danell Leyva, Jake Dalton, and team captain Chris Brooks placed 2nd over all as a team for the day, with China in first place, Japan in third and Great Britain in fourth. After Day 1 of qualification, here’s the lineup: Sam - Floor, Parallel Bars, Vault, Pommel Horse, High Bar, All-Around; Jake - Rings, Vault, Floor; Chris - Rings, Parallel Bars, High Bar, All-Around; Alex - Pommel Horse, Floor, Vault, Rings; and Danell – Pommel Horse, Parallel bars and High Bar. 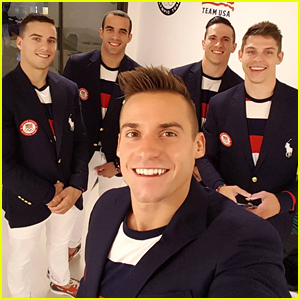 The US Men’s Gymnastics Team is ready to go! Team Captain Chris Brooks shared an inspiring message on Instagram just moments ahead of walking into the arena for their first day of competition at the 2016 Rio Summer Olympics. “This is what it’s all about. The fans and family etc are greatly appreciated of course, but your brothers who were there shoulder to shoulder with you through the grind, the highs and lows of these past 4 years doing everything we could to make team USA stronger,” he wrote, with a massive group pic including Sam Mikulak, Danell Leyva, , Alex Naddour, Jake Dalton, their coaches and alternates.